I make additions and corrections to this web site frequently, but because they are buried somewhere on one of the pages the changes are not very noticeable, so I decided to create this blog section to highlight new material. Here below you will find part of one of the pages that I have recently either changed or added to significantly. The section reproduced here is from my page about Omega. If you have any comments or questions, please don't hesitate to contact me via my Contact Me page. In 1932 Omega introduced a waterproof wristwatch based upon Swiss patent CH 146310 granted to Louis Alix of Geneva. This watch was called the Omega Marine and given the Omega reference number 679. The Omega Marine was the first dive watch, the first watch specifically tested and qualified for diving. Rolex had a firm grip on waterproof screw down crowns through the patented Oyster crown, so Alix's patent design used for the Omega Marine overcame the problem of making the winding stem water proof without infringing Rolex's patents by the simple expedient of sliding the whole watch inside a second outer casing. The patent was also taken out in France, Britain, the USA and Germany. In 1936 an Omega Marine was sunk to a depth of 73 metres in Lake Geneva for 30 minutes. In May 1937 the Swiss Laboratory for Horology in Neuchâtel certified the Omega Marine as being able to withstand a pressure of 13.5 atmospheres, equivalent to a depth of water of 135 metres. These were the first tests to establish the depth capabilities of a watch and qualify its suitability for diving. The Omega Marine was worn whilst diving by Commander Yves Le Prieur, a French Naval Officer and inventor, in 1925, of the aqualung, a self-contained underwater breathing apparatus or SCUBA. The Marine was also worn and endorsed by Dr William Beebe, the American naturalist and explorer who took up underwater exploration in the late 1920s. Yves Le Prieur (1883 - 1963) was an interesting character. He followed his father into the French navy and served in the far east. He went diving using traditional diving equipment with a weighted belt so that the diver walked on the sea bed and a big, heavy, helmet fed with air down a tube from a pump on the surface. He learnt Japanese, became military attaché at the French Embassy in Tokyo, earned a black belt in judo and was the first person in Japan to take off in an aeroplane, a glider. He returned to Europe and during the Great War invented, inter alia, a rocket to bring down balloons and airships, and gun sights that computed the correct angle of fire. He was a creative, restless, inventor all his life. Commander Yves Le Prieur with his Omega Marine © Captain Jacques-Yves Cousteau and Frédéric Dumas 1957. 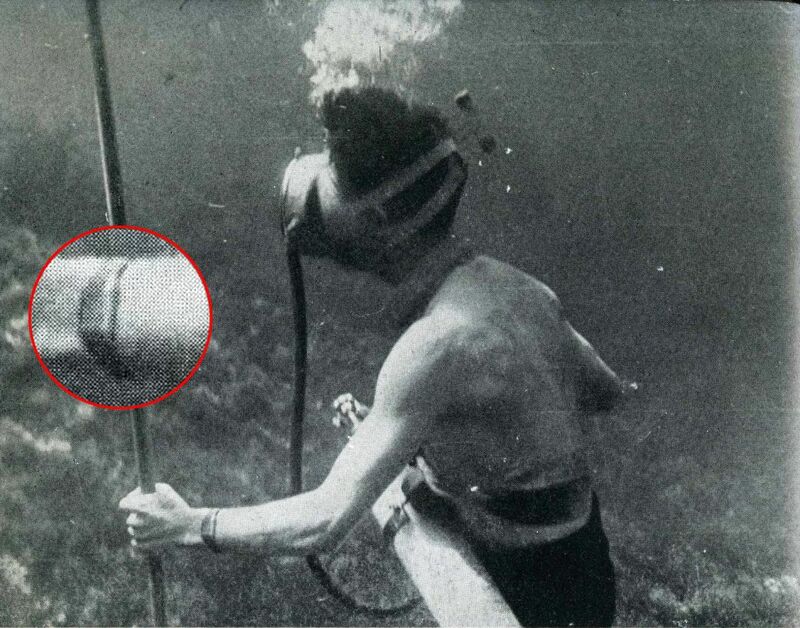 In 1925 Le Prieur saw a demonstration of a diver using a breathing apparatus invented by Maurice Fernez. This consisted of a mouthpiece supplied with air through a tube from the surface, a nose clamp and goggles. Le Prieur was impressed by the simplicity of the Fernez equipment and immediately conceived the idea of using Michelin cylinders as the air supply. Michelin cylinders contained three litres of air compressed to 150 kg/cm2 and were supplied by the Michelin tyre company to garages without air compressors for inflation of car tires. For the first time this invention allowed a diver to submerge without any connection to the surface; Le Prieur had invented the self-contained underwater breathing apparatus, in French "scaphandre", rendered into English as the aqualung or by the acronym SCUBA. The use of unpressurised goggles prevented the diver from going deeper than about 10 metres because the goggles were squeezed onto his face, so in 1933 Le Prieur invented the full face diving mask, a rubber cylinder that covered the eyes, nose and mouth with a glass front to see through. The mask was supplied with air and Le Prieur remarked that the diver could breath through his mouth or nose, or both, at will, and could even talk to other divers by bringing the mask close their ear, the glass acting as a microphone. In 1934 Le Prieur created a second version of the equipment with a full face mask and automatic pressure reducer. The first diving club was created in France in 1935 by Le Prieur and Jean Painleve, it was called the "club des scaphandres et de la vie sous l'eau", the club for divers and life under water. In 1936 the Le Prieur apparatus was officially adopted as diving gear by the French Navy. The 1957 book "The Silent World"Ref. 2 by Captain Jacques-Yves Cousteau and Frédéric Dumas shows this picture of Le Prieur diving with his aqualung and wearing an Omega Marine. The face mask is the later version of the equipment so the picture dates from after 1934. The book tells how Cousteau started diving with Fernez goggles in 1936, and in 1939 used Le Prieur equipment for the first time. In 1942 Cousteau made an improvement to Le Prieur's apparatus by adding a demand regulator, invented by his friend Émile Gagnan, which reduced air consumption and thereby extended the length of time that could be spent under water. It made the apparatus better, but Cousteau did not invent the SCUBA. Dr Beebe is most famous for his 1934 descent in the "Bathysphere" to a depth of 3,028 feet beneath the ocean surface. But Beebe also dived with the older heavy helmet gear and in 1936 he made a dive in the Pacific wearing an Omega Marine. Afterwards he wrote I wore my Omega Marine in the Pacific Ocean at a depth of 14 metres, where the pressure is twice the normal one. My watch sustained this test with success. Its tightness to water and dust and its robustness to corrosion represent a true progress for watchmaking science. Louis Alix's design for the waterproof double case, shown in the figure from the patent, had a curved shape in an arc of a circle. 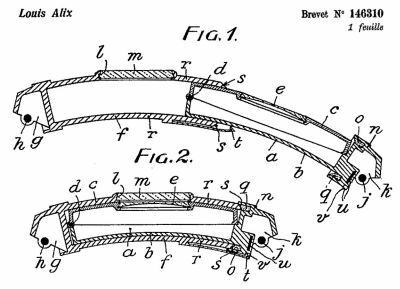 Alix doesn't explain in the patent why this was: it may have been to follow the shape of the wrist, or it may have been a purely aesthetic consideration, this was the age of Art Deco after all. I don't think this curved shape was actually ever used by Omega, all the pictures of Omega Marines which I have seen have been of straight (linear) cases. The elegant curved shape envisaged by Alix would have been difficult and expensive to make at the time and challenging even today. The watch movement, dial, and hands were contained in a rectangular section interior case. This interior case had a shoulder at the end with a groove which contained a gasket. The interior case slid into a rectangular section outer case, the end of which contacted the gasket in the shoulder of the interior case, forming a water tight seal. A large spring clip on the back of the outer case held the two parts of the case together. The clip was necessary to provide the initial seal between the inner case, the gasket, and the outer case, but as the watch was submerged, the air pressure inside the case would remain constant while the water pressure outside the watch increased, pressing the two parts of the case more firmly together, increasing the force on the gasket and making the seal more water tight. The spring clip described by Alix is not how the case clips were actually manufactured. There were two different generations of the Marine case; the first had a massive clasp on the back of the outer case, running right from the top to the bottom. 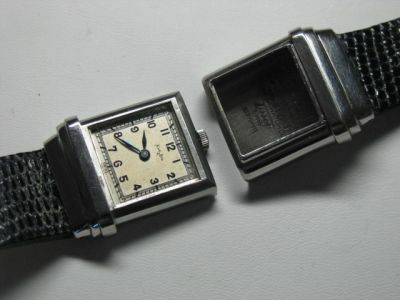 A second generation of the Marine case, from about 1935 onward, had a much shorter clasp hinged close to the bottom edge of the case more like the clip Alix envisaged. The cases of the Omega Marine were mostly made in steel with the prefix CK, so CK 679, but they were also made in precious metals e.g. OJ 679 (OJ = Or Jeune, yellow gold). The cases were made by the company of Frédéric Baumgartner of Geneva. Although Baumgartner’s name doesn’t appear on any of the cases, his company's Poinçon de Maître is found in gold Omega Marine cases. In his patent, Louis Alix suggests that the gasket, the item labelled "q" in the figure, should be made of rubber (" caoutchouc"). In contemporary adverts and in the book by Marco Richon OMEGA - A Journey through TimeRef 1 this gasket is said to be leather. Leather is not a very satisfactory gasket material but at the time it was probably better than the rubber that was available. The patent illustrated a slim crown recessed into a depression on the side of the interior case, but this was not very practical and production models had the crown at the top of the movement, at the 12 o'clock position like a pocket watch. This can be seen in the second of the two pictures here, kindly provided to me by Mike Katz. The Marine was at first fitted with the manual winding stem wind and set calibre 19.4 T1, created in 1930, then later with the improved 19.4 T2, created in 1935, still a manual winding movement. Omega was rather unusual at the time in referring to their calibres in millimetres rather than ligne sizes, and 19.4 means these movements were 19.4 mm diameter. They were round movements, not shaped to the form of the watchcase. The 19.4 T1 and T2 calibres were available with either 15 or 17 jewels and operated at 18,000 vibrations per hour. Although the Marine would have been an ideal candidate for an automatic winding movement, Omega did not introduce their first automatic movements until 1943, with the bumper automatic 28.10 and 30.10 calibres, and the Marine was never fitted with an automatic movement. The outer case had a sapphire crystal in the front so that the dial of the watch in the interior case could be seen. Sapphire was chosen because it was much stronger than glass and this was one of the first uses of it for a wristwatch. The watch strap was made of seal skin, which was thought to be more resistant to water than ordinary leather, and had a unique deployment type clasp. If you have one of these original clasps I would like to know. 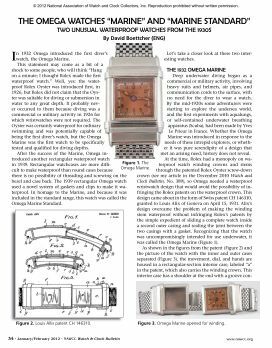 A longer version of this description of the 1932 Omega Marine and 1939 Omega Marine Standard was published in the NAWCC Watch & Clock Bulletin, February 2012. The Omega Marine was not an automatic self winding movement so it would have to be manually wound every day. To wind the watch or set the hands obviously meant removing the inner case from the outer. In addition to being a nuisance, this might have worn the sliding surfaces and imposed wear and tear on the sealing gasket, so the watch would need regular attention to retain its full waterproof capability. The Omega Marine would also have been an expensive watch to make, and hence expensive to buy. I would have guessed that this, together with the inconvenience of its design in daily use, would have restricted its popularity to those who really needed a fully waterproof watch, which is why it is scarce and valuable today. In A Journey Through Time1, numerous examples of the Marine are illustrated in mixtures of steel and gold, as well as 18 carat gold versions retailed by Tiffany and Cartier in New York. 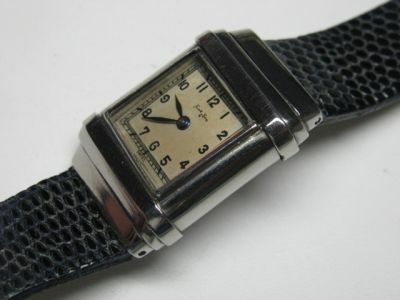 The case design naturally lent itself to the art-deco style in vogue at the time, and Marine's with art-deco dials and strap lugs were produced. Obviously these precious metal cases and art-deco design features weren't necessary in a diver's watch, and are in stark contract to the strictly functional steel cases and easy to read dials of today's diver's watches. It would seem that, just as today, watches with unusual technical features attracted the attention of those who like something different, perhaps because they like impressive gadgets, or to impress their friends, and the Omega Marine sold to many people who wouldn't dream of diving deeper than their local swimming pool. In 2007 Omega added a reproduction of this watch, the Marine 1932, to its Museum Collection of vintage timepieces. The double case was made in contrasting 18-carat red and white gold, and the series was limited to 135 pieces to commemorate the 1937 official certification of water resistance to a depth of 135 metres. The watch in Mike Katz's pictures is actually a version of the Marine produced by Omega's sister company Tissot. It is branded "Omega Watch Co. Tissot" in the case back and on the movement. Paul Brandt began the process of bringing Omega and Tissot together in 1925, and by 1930 Paul Tissot-Daguette was managing director of Omega as well as a director of Tissot. The two companies became subsidiaries of a multi-national holding organisation, Société Suisse pour l'Industrie Horlogére (SSIH) to produce a complete range of watches, and for joint sales promotions. 2. "The Silent World", 1953. Co-authored by Captain Jacques-Yves Cousteau and Frédéric Dumas and edited by James Dugan. Copyright © David Boettcher 2006 - 2019 all rights reserved. This page updated June 2018. W3CMVS.